Many children dress up in fancy costumes and visit other homes in the neighborhood. At each house, they demand sweets, snacks or a small gift. If they do not get this, they threaten to do some harm to the inhabitants of the house. This is known as playing 'trick-or-treat' and is supposed to happen in a friendly spirit, with no nasty or mean tricks being carried out. However, if your children take part, it is important to accompany them and to check their 'treats' to make sure they are safe to eat or play with. Halloween is not an official holiday. Government offices and businesses are open as usual and public transit services run on regular schedules. If you drive around in late afternoon or evening, it is important to keep a careful lookout for children who are unaccustomed to being out on the street after dark. If they are wearing dark costumes or masks, they may be less easy to see than normal. They may also be excited and dart out unexpectedly from between vehicles or behind bushes. Halloween originated as a pagan festival in parts of Northern Europe, particularly around what is now the United Kingdom. Many European cultural traditions hold that Halloween is a time when magic is most potent and spirits can make contact with the physical world. In Christian times, it became a celebration of the evening beforeAll Saints’ Day. Immigrants from Scotland and Ireland brought the holiday to the United States. The commercialization of Halloween started in the 1900s, when postcards and die-cut paper decorations were produced. Halloween costumes started to appear in stores in the 1930s and the custom of 'trick-or-treat' appeared in the 1950s. The types of products available in Halloween style increased with time. Now Halloween is a very profitable holiday for the manufacturers of costumes, yard decorations and candy. There are various symbols associated with Halloween. These include the spooks, ghosts and walking skeletons that represent the contact between the spiritual and physical world and between the living and the dead. Human figures that are often represented on Halloween are witches and wizards, who are seen to have the power to contact the spirit world. Bats, black cats and spiders are often connected with this holiday. These animals are associated with the night and darkness and often accompany witches and wizards. There are also a range of objects associated with Halloween. These include blood, fire, gravestones, pumpkins, bones and skulls. They all have connections with death, the spirit world or protecting property from evil spirits. Many of these objects are now available in stores as decorations for the Halloween season. NEW YORK, USA (AP) - Facebook's stock price is falling now that employees are able start selling restricted stock in the company. A lock-up period that had prevented such sales expired on Monday. US stock markets opened on Wednesday for the first time since Superstorm Sandy hit the East Coast, so that's when employees could start selling. Facebook Inc's stock is down 94 cents, or 4.3 per cent, to US$21 in morning trading. Two homosexual Jamaicans have mounted a legal challenge against the laws of the island, which in effect criminalises the act of homosexuality, on the basis that they are unconstitutional and promotes homophobia throughout the Caribbean. According to the article published on www.guardian.co.uk last week, this landmark action, which is being supported by the United Kingdom-based Human Dignity Trust, is aimed at removing three clauses of the island's Offences Against the Persons Act of 1864, commonly referred to as the buggery laws. In Clause 76 of the act, while not formally banning homosexuality, provides for up to 10 years' imprisonment, with or without hard labour for anyone convicted of the "abominable crime of buggery committed either with mankind or any animal". Two further clauses outlaw the attempted buggery and gross indecency between two men. The mounting battle over the legislation is being blamed by critics for perpetuating a popular culture of hatred against homosexuals as is evidenced by the derision of these men in dancehall music, the article notes. It continues that the legal challenge is being taken to the Inter-American Commission on Human Rights, which is modelled on the European Court of Human Rights to which Jamaica is not a full member. However, any ruling being made by the court would only be advisory and would nevertheless send out a strong message of international disapproval. The article quotes the executive director of the Jamaica Forum of Lesbians, All-Sexuals and Gays (J-Flag) as saying, "This year there has been nine murders. The violence in Jamaica is having a spillover effect on other parts of the Caribbean: St Lucia now has a murder every year or so," he said. An executive chief of the Human Dignity Trust and a London barrister was also quoted as saying, "We want to ensure that Jamaica satisfies its international human rights treaty obligations. We are supporting J-Flag in this case," said the executive chief. One body arguing to preserve the Offences Against the Persons Act is the Lawyers' Christian Fellowship of Jamaica. The Office of the Prime Minister in Jamaica did not respond to enquiries made by The Guardian, the article concluded. In the meantime, other legal challenges have been mounting in recent weeks, as an attorney has taken the decision to bring two of Jamaica's major free-to-air television stations to court claiming a breach of his human rights for failure to air an advertisement. Kim Kardashian Pregnant with Kanye West's Twins?! Ever since Kim Kardashian and Kanye West hooked up back in the spring, the Kardashian-Jenners have been pushing the "Kimye marriage and babies" storyline to the press non-stop. The first report of the two moving in together surfaced just a month after they went public with their romance, and since then there have been almost weekly reports about a wedding or pregnancy, which hasn't happened. And now another tabloid is recycling the same old stories. The National Enquirer has upped the "marriage and babies" ante, claiming not only that Kim wants to get pregnant with Kanye's twins, but also that she's planning a ridiculously over-the-top $20 million wedding. "Kim originally planned to use a surrogate to preserve what she calls her 'money-maker,' that being her curvaceous shape. But after their trip to Italy, she said, 'All I want now is to be Kanye's wife and the mother of his babies. I don't care what it does to my figure!'" a "source close to her" tells the mag, adding, "Kim wants to make sure her first delivery will be twins." It's really hard to believe that Kim wouldn't be worried about what pregnancy would do to her body when her whole "career" is based on her looks. And why does she want twins? Does she want to have two at once so she doesn't have to get pregnant again? Does she think that double the babies equals double the attention she'll get? Whatever the reasoning, Kim is supposedly already researching "high-tech fertility treatments" and is planning to spend $200,000 to get knocked up. But interestingly, The Enquirer also claims that before their trip to Italy, Kim hadn't been certain she wanted to have kids with Kanye because she "had been unsure of her commitment to" him. "Kim and Kanye were having problems," The Enquirer's snitch says. "He was resisting pressure from Kim's mom Kris [Jenner] to play a bigger role in the family's reality TV show, and they'd been fighting. But seeing pictures of a voluptuous-looking Kim on the beach in Miami had Kanye salivating. Some people may think she looks heavy in the front and rear, but Kanye loves her that way. Kim has always been his perfect woman. And while they were in Italy, Kanye showed Kim that he's everything she's ever dreamed of in a man." Their issues were magically solved by Kim in a swimsuit and a few "gourmet meals at the finest restaurants and swanky suites at the ritziest hotels"? Oh yeah, this relationship's definitelygoing to last! How come The Enquirer buried the lead about these two "having problems," anyway? That is actual news, instead of the usual "they're so in luuuuuuurve" stories that the tabloids usually run. But The Enquirer quickly glosses over the suggestion that not everything is perfect for Kimye and claims that the two are planning "a lavish $20 million wedding as soon as her divorce from Kris Humphries is final." In fact, Kanye allegedly wanted to propose while they were in Italy, but "they decided to wait" because they were worried "that an engagement wouldn't look good with Kim's divorce from Kris still un­settled." So they went from "having problems" and "unsure of [their] commitment" to "would have gotten engaged except Kim's still married to some other guy" in like a weekend? Sure. That sounds like Kim's reasoning. And given this is the second time a tabloid has run a $20 million wedding report lately, there might be something to it. But considering a story like this surfaces every single week but Kimye still haven't moved in/gotten engaged/gotten pregnant, hopefully this is just another tabloid false alarm. What do you think? Does Kim Kardashian want to have twins with Kanye West? Will they blow $20 million on a gaudy, over-the-top wedding? Sound off in the comments! NEW YORK, USA (AP) - Oil prices rose Wednesday on concerns about near-term oil supplies in the US following a fierce storm that caused havoc across the northeastern part of the country and was threatening to inflict more damage inland. By early afternoon in Europe, those concerns helped benchmark crude for December delivery rise 65 cents to US$86.33 a barrel in electronic trading on the New York Mercantile Exchange. The contract rose 14 cents to finish at US $85.68 a barrel in New York. In London, Brent crude, used to price many international varieties of oil, was up 38 cents to US$109.46 per barrel on the ICE Futures exchange. A hurricane that evolved into a winter superstorm, Sandy cut power to more than eight million homes, shut down 70 per cent of East Coast oil refineries and inflicted worse-than-expected damage in the New York metropolitan area. That area produces about 10 of US economic output. The storm will end up causing about US$20 billion in property damages and $10 billion to $30 billion more in lost business, according to IHS Global Insight, a forecasting firm. Widespread power outages and transportation disruptions, and hazardous driving conditions would likely reduce demand for energy. But analysts said crude imports will likely be reduced until East Coast ports reopen. "So even if refineries were able to get up and running soon, there's a good chance we won't have the feedstock to keep them going," Carl Larry of Oil Outlooks and Opinions. NEW YORK, USA (AP) — The misery of superstorm Sandy's devastation grew yesterday as millions along the US east coast faced life without power or mass transit for days, and huge swaths of New York City remained eerily quiet. The US death toll climbed to at least 48, many of the victims killed by falling trees, and rescue work continued. The storm that made landfall in New Jersey on Monday evening with hurricane force cut power to more than 8.2 million people across the East and put the presidential campaign on hold just one week before Election Day. New York was among the hardest hit, with its financial heart closed for a second day. The storm caused the worst damage in the 108-year history of the city's subway system, and New York City Mayor Michael Bloomberg said it could be four or five days before the biggest US transit system was running again. "This was a devastating storm, maybe the worst that we have ever experienced," Bloomberg said. But the full extent of the damage in New Jersey was being revealed as morning arrived. Emergency crews fanned out to rescue hundreds. A hoarse-voiced New Jersey Governor Chris Christie gave bleak news at a morning news conference: Seaside rail lines washed away. No safe place on the state's barrier islands for him to land. Parts of the coast still under water. "It is beyond anything I thought I'd ever see," he said. "It is a devastating sight right now." The death toll from Sandy in the US included several killed by falling trees. Sandy killed 18 people in New York City. It also killed 69 people in the Caribbean before making its way up the eastern seaboard. Airlines cancelled more than 15,000 flights. New York City's three major airports remained closed. Some bridges into the city reopened at midday, but most major tunnels and bridges remained closed, as were schools and Broadway theatres. The storm sent a nearly 14-foot (4.27-metre) surge of seawater, a record, coursing over Lower Manhattan's seawalls and highways and into low-lying streets. The water inundated tunnels, subway stations and the electrical system that powers Wall Street and sent hospital patients and tourists scrambling for safety. Skyscrapers swayed and creaked in winds that partially toppled a crane 74 storeys above Midtown. A large tanker ship ran aground on the city's Staten Island. Around midday, Sandy was about 120 miles (190 kilometres) east of Pittsburgh in Pennsylvania, pushing westward with winds of 45 mph (72 kph), and was expected to make a turn into New York State last night. Although weakening as it goes, the storm will continue to bring heavy rain and flooding, said Daniel Brown of the National Hurricane Centre in Miami. US President Barack Obama says Bob Marley’s music helped raise his awareness about the struggles of persons outside the US during his college years. During a sit down with MTV’s Sway Calloway last Friday, the president spoke of the power of music, and zoned in on political music and its impact during Marley’s time. “I can remember when I was in college listening and not agreeing with his whole philosophy, necessarily, but raising my awareness about how people outside of our country were thinking about the struggles for jobs and dignity and freedom,” Obama said in reference to Marley. Others like Bob Dylan, Public Enemy and Rage Against the Machine, with political and protest songs, kept the mission going. “And so I would hope that we are gonna see more of that,” he added, explaining that this focus was lacking in today’s music forms. “We haven’t seen as much directly political music, I think the most vibrant musical art-form right now over the last 10 to 15 years has been hip hop,” said Obama. NEW YORK, USA (AP) — As Superstorm Sandy marched slowly inland, millions along the US East Coast awoke today without power or mass transit, with huge swaths of the nation's largest city unusually vacant and dark. New York was among the hardest hit, with its financial heart in Lower Manhattan shuttered for a second day and seawater cascading into the still-gaping construction pit at the World Trade Centre. The storm that made landfall in New Jersey on Monday evening with 80 mph (130 kph) sustained winds killed at least 16 people in seven states, cut power to more than six million homes and businesses from the Carolinas to Ohio, caused scares at two nuclear power plants, and put the presidential campaign on hold a week before Election Day. The massive storm reached well into the Midwest: Chicago officials warned residents to stay away from the Lake Michigan shore as the city prepares for winds of up to 60 mph (96 kph) and waves exceeding 24 feet (7.2 meters) well into Wednesday. An unprecedented 13-foot (3.9-meter) surge of seawater — 3 feet (90 centimetres) above the previous record — gushed into lower Manhattan, inundating tunnels, subway stations and the electrical system that powers Wall Street, and sent hospital patients and tourists scrambling for safety. Skyscrapers swayed and creaked in winds that partially toppled a crane 74 stories above Midtown. President Barack Obama declared a major disaster in New York and Long Island, making federal funding available to residents of the area. Remnants of the former Category 1 hurricane were forecast to head across Pennsylvania before taking another sharp turn into western New York state by Wednesday morning. As of 5 am (0900 GMT) today, the storm was centered about 90 miles (145 kilometres) west of Philadelphia. Although weakening as it goes, the massive storm — which caused wind warnings from Florida to Canada — will continue to bring heavy rain and local flooding, said Daniel Brown, warning coordination meteorologist at the National Hurricane Centre in Miami. Just before it made landfall at 8 pm near Atlantic City, New Jersey, forecasters stripped Sandy of hurricane status — but the distinction was purely technical, based on its shape and internal temperature. It still packed hurricane-force wind, and forecasters were careful to say it was still dangerous to the tens of millions in its path. Officials blamed at least 16 deaths in the US on the converging storms — five in New York, three each in New Jersey and Pennsylvania, two in Connecticut, and one each in Maryland, North Carolina and West Virginia. Three of the victims were children, one just eight years old. At least one death was blamed on the storm in Canada. Sandy, which killed 69 people in the Caribbean before making its way up the Atlantic Coast, began to hook left at midday Monday toward the New Jersey coast. Even before it made landfall, crashing waves had claimed an old, 50-foot (15-meter) piece of Atlantic City's world-famous Boardwalk. "We see a pop. The whole sky lights up," said Dani Hart, 30, who was watching the storm from the roof of her building in the Navy Yards in Brooklyn. "It sounded like the Fourth of July," Stephen Weisbrot said from his 10th-floor apartment in lower Manhattan. A huge fire destroyed at least 50 homes in a flooded neighbourhood by the Atlantic Ocean in the New York City borough of Queens. Firefighters told WABC-TV that they had to use a boat to make rescues. Two people suffered minor injuries, a fire department spokesman said. The fire was reported around 11 pm Monday in an area flooded by the superstorm that began sweeping through the city earlier, officials said. Firefighters told WABC-TV that the water was chest high on the street, and they had to use a boat to make rescues. They said in one apartment home, about 25 people were trapped in an upstairs unit, and the two-storey home next door was ablaze and setting fire to the apartment's roof. Firefighters climbed an awning to access the trapped people, and took them downstairs to the boat in the street. Video footage of the scene shows a hellish swath of tightly packed homes fully engulfed in orange flames as firefighters hauled hoses while sloshing in ankle-high water. Many homes appeared completely flattened by the wind-whipped flames. The neighbourhood sits on the Rockaway peninsula jutting into the Atlantic Ocean. In September, the beachfront neighbourhood was struck by a tornado that hurled debris in the air, knocked out power and startled residents who once thought of twisters as a Midwestern phenomenon. New York University's Tisch Hospital was forced to evacuate 200 patients after its backup generator failed. NYU Medical Dean Robert Grossman said patients — among them 20 babies from the neonatal intensive care unit who were on battery-powered respirators — had to be carried down staircases and to dozens of ambulances waiting to take them to other hospitals. Trading at the New York Stock Exchange was cancelled again Tuesday — the first time the exchange suspended operations for two consecutive days due to weather since an 1888 blizzard struck the city. Airlines cancelled around 12,500 flights because of the storm, a number that was expected to grow. Off North Carolina, not far from an area known as "the Graveyard of the Atlantic," a replica of the 18th-century sailing ship HMS Bounty that was built for the 1962 Marlon Brando movie "Mutiny on the Bounty" sank when her diesel engine and bilge pumps failed. Coast Guard helicopters plucked 14 crew members from rubber lifeboats bobbing in 18-foot (5.4-meter) seas. One of the units at Indian Point, a nuclear power plant about 45 miles (72kilometers) north of New York City, was shut down around 10:45 pm Monday because of external electrical grid issues, said Entergy Corp, which operates the plant. The company said there was no risk to employees or the public. And officials declared an "unusual event" at the Oyster Creek nuclear power plant in Lacey Township, New Jersey, the nation's oldest, when waters surged to 6 feet (1.8 meters) above sea level during the evening. Within two hours, the situation at the reactor — which was offline for regular maintenance — was upgraded to an alert, the second-lowest in a four-tiered warning system. Oyster Creek provides 9 percent of the state's electricity. Hundreds of miles (kilometres) from the storm's centre, gusts topping 60 mph (96 kph) prompted officials to close the port of Portland, Maine, scaring away several cruise ships. A state of emergency in New Hampshire prompted Vice President Joe Biden to cancel a rally in Keene and Republican nominee Mitt Romney's wife, Ann, to call off her bus tour through the Granite State. President Barack Obama scrapped his campaign events for Monday and today to hunker down at the White House to oversee the government's response to the superstorm and project presidential leadership. Romney was going ahead with a planned event in Ohio today, but his campaign said its focus would be on storm relief. Naomi Campbell's Russian billionaire boyfriend is so keen to have his loved one close to him that he has built her a house in Moscow. And not just any house. The building, located just outside the Russian city, features a futuristic style, and many believe it looks like a spaceship. The unusual house, which is dubbed Capital Hill, looks like it could be a tool to take over the universe, both on the exterior and the interior. Russian entrepreneur Vladislav Doronin has been dating the British supermodel since 2008, and reportedly plans to live in the mansion after they get married. With an estimated £1.5 billion fortune, the 46-year-old property tycoon has a penchant for high-living and beautiful women that has earned him the nickname of Moscow's Donald Trump. According to Gizmodo, the new futuristic house is designed by renowned architect Zaha Hadid, who specialises in ecostyle buildings and was also the brains behind famous buildings including the opera house in Guangzhou and the Olympics Aquatics Centre in London. It features gigantic glass panels, smooth curves and extremely tall ceilings. The 2,650- square metre house will have many luxuries, including a Finnish spa in the basement, a Turkish bath and a Russian bath where the 42-year-old supermodel can pamper herself. Of course, it also has its own gym and indoor swimming pool that can reportedly turn into a dance floor should the couple want to entertain guests in the evenings. Two large white towers are situated on top of the building, about 20 metres above the ground, which are said to be the couple's bedroom. She's not the most conventional of women, but when it comes to her relationship, Lady Gaga is nothing if not normal. Gaga's boyfriend Taylor Kinney dispelled any rumours of anything bizarre in the romance as he opened up about the pair's relationship during an interview on The Today Show. Asked if it was strange to date someone like Gaga, Kinney, who was promoting his new TV show Chicago Fire, replied: "I don't know, because I don't have that outside view. It's normal, if you will, in that respect. I'm a happy guy. I'm a lucky guy." Kinney also spoke about the fact that Gaga has been publicly supporting his new project, in which he stars as Lt Kelly Severide, by tweeting her love of the show. He said: "I was surprised. I think she's proud, you know, a girlfriend being proud of her boyfriend. She's been to the set a couple of times." However, Kinney said he does sometimes find it difficult to cope with the distance when Gaga goes on tour. But he joked: "She hasn't said anything, but she has a spaceship and she can get from A to B pretty quickly." Kinney also spoke about his role on Chicago Fire, which follows the events inside Firehouse 51. Explaining that he trained with real firemen for the role, Kinney said he has a new-found respect for the profession. He said: "If you do get engulfed in flames even with the gear, the suits that these guys wear, you only have 18 seconds until you're toast. Getting to ride along with these guys ... it's that respect and adoration that you had for these men and women when you were a kid." Rihanna's best friend Melissa Forde has landed in hot water after making a racist slur against Chris Brown's ex-girlfriend Karrueche Tran. Melissa Forde defended her superstar pal against fans of Chris Brown's ex on Twitter. But she has reignited the war of words between the two camps after using the term 'rice cake' to describe Karruche, who is of Asian origin. Forde was telling a fan of Tran that it was okay not to like Rihanna but that she shouldn't insult her best friend before it all got a little too heated. In the Instagram rant, she wrote: "I get that you don't like my Bfff and trust you don't have to, cause the one thing you not liking us will do is stop anything from moving forward!! 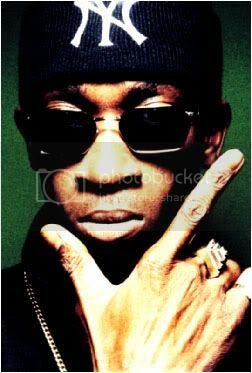 You can be rice cake's friend I don't give a f***, but keep up all this disrespectful talk and while your fake profile having azz is typing on Instagram MEE Melissa T Forde will be the one knocking on your door asking you to come talk face to face!" NEW ORLEANS (AP) — Madonna drew boos and triggered a walkout by several concertgoers after she touted President Barack Obama on her MDNA Tour in New Orleans. The Material Girl asked during Saturday night's performance: "Who's registered to vote?" She added: "I don't care who you vote for as long as you vote for Obama." Drawing boos in touting Obama over Republican Mitt Romney, Madonna followed: "Seriously, I don't care who you vote for... Do not take this privilege for granted. Go vote." Authorities warned millions of Americans from North Carolina to New England to prepare for gale-force winds, life-threatening floods and even snow as Hurricane Sandy churned up the Atlantic coast Sunday, threatening to make landfall somewhere between Virginia and Connecticut by late Monday or early Tuesday. "The weather is already going downhill in mid-Atlantic states," as tropical-storm conditions lashed North Carolina on Sunday morning, Rick Knabb, director of the National Hurricane Center, said in a conference call. In preparation for Hurricane Sandy's arrival, Gov. Cuomo ordered the MTA to suspend service beginning 7 p.m. Sunday. Metro North and Long Island Rail Road service will also stop at that time. Service is expected to be suspended until Tuesday. State and city officials up and down the East Coast kicked into action Sunday, ordering schools and transit systems to close and low-lying and coastal areas to evacuate as they watched the giant storm crawl up the coastline, pummeling parts of North Carolina and Virginia. The nation's largest transit system by ridership, in New York City, was scheduled to shut down Sunday starting at 7 p.m. The New York Stock Exchange said its trading floor would be closed starting Monday, the first weather-related shutdown in 27 years. Earth movers build protective berms as the first signs of Hurricane Sandy approach on Sunday in Westport, Conn.
Amtrak announced via Twitter on Sunday afternoon that it was canceling all Northeast Corridor and Keystone Service route trains on Monday, as well as other inland routes along the East Coast. The National Weather Service said Sandy, whose hurricane-force winds extend 175 miles out from its center, could bring extensive flooding, power outages for millions of residents and other extreme weather conditions to multiple states from North Carolina to New Hampshire. Temperatures could drop below 30 degrees Fahrenheit in the coming days across the eastern U.S., thanks to expected interaction with cold-weather systems, bringing further misery to those without power. 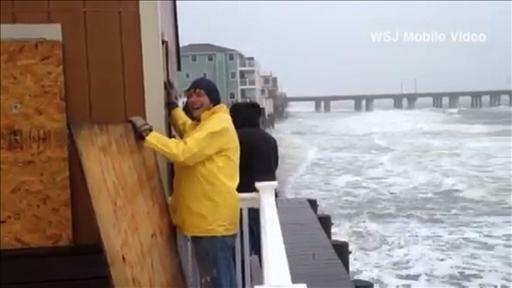 Sandy was about 270 miles southeast of Cape Hatteras, N.C., and 575 miles south of New York City at 2 p.m. EDT Sunday, according to the National Weather Service. The Category 1 hurricane, with winds up to 75 miles per hour, was moving toward the northeast at 14 miles an hour, before it was expected to turn to the northwest late Sunday or early Monday. Mr. Knabb said Sandy would most likely make landfall late Monday night or early Tuesday morning somewhere between the Delmarva Peninsula of Delaware, Maryland and Virginia, and New York's Long Island. 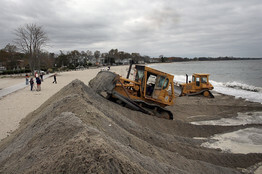 The National Weather Service warned Sandy could bring coastal storm surges of four to six feet in southeast Virginia, one to three feet in Long Island Sound and Raritan Bay, including New York harbor, and six to 11 feet elsewhere from Ocean City, Md., to the border of Connecticut and Rhode Island. Inland areas were also on alert, as flooding from rivers in Pennsylvania and other states pose a serious threat. Sandy could bring early snow to West Virginia, as well as Virginia, Kentucky and North Carolina. New York Gov. Andrew Cuomo ordered a shutdown of the Metropolitan Transportation Authority, including New York City's subway system, commuter trains and buses, affecting a ridership that totals 8.5 million on an average weekday. Mayor Michael Bloomberg ordered the evacuations of 375,000 people from parts of New York City and ordered city schools to close Monday. In Virginia Beach, VA, restaurant owner Denice Shafiee is shuttering her restaurant as Hurricane Sandy bears down. WSJ's Cameron McWhirter reports via #WorldStream. "I know that we get accustomed to hearing weather forecasts and sometimes we're dubious about the weather forecasts, but this is nothing to play with, and this is nothing to take lightly, so take this seriously," Mr. Cuomo said. "In a situation like this, you prepare for the worst and hope for the best." Howard Glaser, Mr. Cuomo's director of state operations, said storm surges were projected to be five to 11 feet, "which would be record levels," beginning midday Monday and running through Tuesday. He also said winds are projected to reach a sustained 35 to 50 miles per hour during that period. Trading in securities listed on the New York Stock Exchange will be moved to an electronic trading platform, the exchange said Sunday. CME Group, CME +0.76% the world's largest futures-exchange operator by volume, also said its New York commodity trading floor would be closed Monday because it is in an area subject to a mandatory evacuation. New Jersey Transit planned to shut down its transportation service starting at 4 p.m Sunday. Philadelphia opened three high schools Sunday to serve as shelters during Sandy for people living in flood-prone areas. Maryland Gov. Martin O'Malley warned residents not to underestimate the potential danger from, predicting days of power outages and announcing a disruption in the state's early voting program. Officials expect some flooding along the Chesapeake Bay and waves in Ocean City could reach levels not seen since Hurricane Gloria, the 1985 storm that resulted in multiple fatalities, he said. "This is a serious, killer storm. It will likely take more lives as it hits the mid-Atlantic," Mr. O'Malley said. Baltimore officials set up shelters and handed out sandbags to residents who live near the water. "We are treating it like it's going to be a catastrophic event," said Connor Scott, the city's director of emergency preparedness. Tourists in Atlantic City, N.J., placed their last few bets Sunday morning before gambling was shut down and casinos evacuated. Gov. Chris Christie had ordered the casinos to cease gambling by 3 p.m. Sunday and evacuate by 4 p.m., but several casinos closed tables earlier than that. Downtown Atlantic City was soaked by the afternoon. Retail stores had taped or boarded up their windows and placed sandbags against their doors. Some hospital and casino workers said they were staying in the hotels through the storm. Dominion Power, which provides electricity in both Virginia and North Carolina, reported Sunday afternoon that 2,524 customers and businesses were without power. In Norfolk, Va., homes and streets along the shore and inlets were flooding by 11 a.m. as people made their way to stores to stock up on supplies amid increasingly heavy rains and winds. Norfolk Naval Base moved ships offshore away from the storm, and the commander of the Navy's mid-Atlantic region, Rear Admiral Tim Alexander, ordered staff at bases in the area to batten down. Commercial port operations in the area were closed. In Virginia Beach, Denice Shafiee, who owns the restaurant Alexander's on the Bay with her husband, spent Sunday anxiously securing the kitchen and other parts of the restaurant while her husband and workers drilled in large pieces of plywood over the windows which look out on where the Atlantic Ocean meets the Chesapeake Bay. Gray roiling waves surged and pounded the beach, and hard rain pelted the windows. The couple first bought the restaurant on Ocean View Avenue in 2007, but they were almost wiped out in 2009 when a storm destroyed the restaurant and its parking lot, causing about $800,000 in damages. If the power goes out, she said, the couple would guard their store against looters and risk being hurt in the storm. "I'm more afraid to not be here and not defend it, because then I'm at home worrying," she said. The storm flooded some roadways in North Carolina, according to Jamie Kritzer, a spokesman for the state's emergency operations center, including reports of water surging over parts of Highway 12, the main artery for the Outer Banks. Gov. Bev Perdue declared North Carolina's eastern counties to be in a state of emergency, and the state opened two shelters. In Washington, D.C., the Marine Corps Marathon went on as planned in the morning under gray gusty skies, while residents heeded warnings such as one from the Federal Emergency Management Agency to stock up on enough food and water for a three-day power outage. Some area grocery stores ran out of staples like bottled water and canned goods. City and state officials braced Sunday for a brutal beating by Hurricane Sandy, ordering all public transportation to shut down, city schools to shutter and all residents living low-lying neighborhoods to evacuate for higher ground. Gov. Cuomo ordered the MTA to suspend all subway, bus and commuter rail service beginning Sunday evening and urged people to stay at home. In addition, Mayor Bloomberg ordered all residents of flood-prone areas — known as Zone A — to evacuate their homes by Sunday afternoon, adding that all public schools would close Monday. Subway and train service will come to a grinding halt by 7 p.m., the governor said, while bus service will begin its shutdown at 9 p.m. It is unclear how long mass transit will remain out of service, the governor said. The violent squall — already being dubbed “Frankenstorm” because it will combine with a storm system from the west and cold air from Canada — is expected to wreak true havoc on the New York region starting Monday morning. Weather forecasters predict gusts of wind to top 80 miles per hour and storm surges to reach 11 feet when the killer ‘cane makes landfall along the central New Jersey coast Monday night--right at high tide. “Unfortunately, this sort of storm in the worst case scenario for our region,” said Sean Potter, a National Weather Service spokesman. Hurricane Irene battered New York City for 12 hours last year, but this “Frankenstorm” is expected to pummel the area relentlessly for 24 to 36 hours, forecasters said. This is nothing to play with," said Cuomo. "This is nothing to take lightly. "You want to stay at home, be prepared, enjoy the family, read a book," Cuomo added. 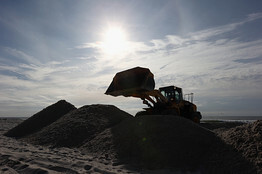 But such a luxury will not exist for the 375,000 people living in Brighton Beach, Battery Park, Broad Channel and other low-lying “Zone A” neighborhoods Bloomberg ordered evacuated by Sunday afternoon. “I’m going home to my mother’s in Staten Island,” said Jeffrey Stainback as he loaded clothes and blankets into an SUV near his fourth-floor apartment at the Coney Island houses. Stainback, 27, said he’d also pack food and playpen for his wife and three kids while they waited out the perfect storm. The city has also set up 72 shelters across the city to house Zone A evacuees and their pets, but some neighborhood residents near the water said they’re staying put. “I’m getting prepared and we are going to stick it out,” said Marilyn Harris, 63, whose Richards St. apartment is four blocks from the Red Hook, Brooklyn, waterfront. High wind warnings will go into effect at 6 a.m. Monday morning and last through 6 p.m. Tuesday. Meanwhile, the National Weather Service has issued a coastal flood warning from 6 a.m. Monday to 3 p.m. Tuesday. Amtrak announced Saturday that it would halt train service to parts of the East Coast, including trips between Washington and New York. Airlines have started adding Sunday flights out of New York in preparation for flight cancellations on Monday. Meanwhile, Nassau and Suffolk county officials have urged residents of low-lying areas to evacuate. Officials have ordered a mandatory exodus from Fire Island. Dozens of people wheeled suitcases and pet carriers off the Ocean Beach Ferry Terminal at Bay Shore, L.I.,just one hour before Fire Island’s mandatory 2 p.m. evacuation curfew. Fire Island residents are evacuated. Frazzled residents said the storm surge has already brought the ocean to the dunes and some roads are already a foot under water. "When you get off the boat, it's 18 inches deep," said Ilene Patrick, 56, who owns two homes and a business on the island. She had winterized her homes and boarded up the house closest to the ocean. "We're off. There's nothing we can do now," she said. Others were already preparing to come back to ruined homes. "We actually kind of said little good byes to the house," said Dumbo, Brooklyn mom of two, Carolina Della Valle. "You just never really know." Officials are also activating 1,100 National Guard members, 400 on Long Island and 200 in the city. The state Department of Health is ordering that all adult nursing homes be staffed at 150 percent of standard levels and that staff is prepared to stay for 48 to 72 hours, the governor said. Utility companies across the state will also be on standby to help with power outages. 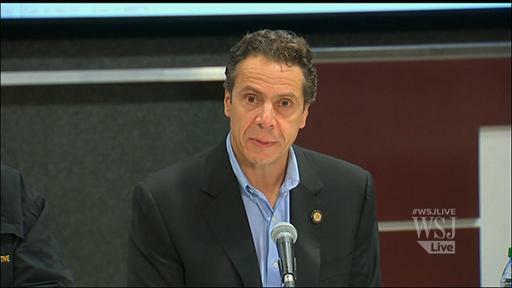 "In a situation like this you prepare for the worst and hope for the best," Cuomo said. NEW YORK, USA (AP) — Just in time for Halloween, New York police say a drug raid in Buffalo turned up 640 marijuana lollipops that had been obtained in California where medical marijuana is legal. The Buffalo News reports that police raided a party on Thursday attended by some University of Buffalo students and found the Jolly Lolly suckers, as well as leaf marijuana, cocaine and $13,000 in cash. At least one person was arrested on felony drug charges. He allegedly had the candies shipped across the country to Buffalo. Medical marijuana is not legal in New York. BlackBerry Messenger is an instant messenger program for BlackBerry-to-BlackBerry communication utilizing your PIN code. What is a PIN, and where do I find mine? A PIN is an eight digit alpha-numeric sequence that is assigned to every BlackBerry device. You can find your PIN code by going to Options>Status>PIN. You can also find your PIN code by typing "mypin" into an email (no quotes). The BlackBerry will automatically insert your PIN code. Where do I get BlackBerry Messenger? BlackBerry Messenger is built into some of the newer devices. If your device does not come preloaded with BlackBerry Messenger, you can download it athttp://www.blackberry.com/messenger through Internet Explorer or your BlackBerry Browser. You cannot download it through FireFox Browser. Do I need a data plan to use BlackBerry Messenger?Yes, BlackBerry Messenger sends pin messages through the BlackBerry servers. A BlackBerry internet plan is required to use this functionality. Does BlackBerry Messenger cost money to use?No, BlackBerry Messenger is free to use. It simply uses data from your data plan. It does not use SMS. How do I add a contact to BlackBerry Messenger?To add a contact, first open BlackBerry Messenger. Click the track wheel/track ball to bring up the menu and select add contact. When you click on add contact, you will be brought to your address book to select the contact you want to add. Simply click on the contact and select request. If you do not have the contact in your address book, scroll to the top of the list and highlight 'use once'. When you click the wheel, you will be able to request by PIN or by email. Select the appropriate one based on what information you possess. You will be offered the option to personalize the message sent to the recipient before your request is sent. Mr. Vegas was seen crying on onstage about is girlfriend cheating with a next man. But one thing I have to say to Vegas is what goes around comes around. A popular sound operator from Montego bay Jamaica was doing some work with Vegas. He left Vegas at his home with his wife when he returned he caught Vegas in a Compromising positions with his wife. A few days later Vegas went to the studio and voice a tune call “You should a see the position me a wuk you woman in a last night” so why is Vegas crying now that him caught his girl with a next man. You can give bun but you can’t take Bun lol. A lot of these dancehall artist a live a certain way and when the real reality reach them they want pity from the public. Bun fi Bun DJ Captain Barkley Got the final bun it so hot it kill him, Beanie Man the gal in a bundle Dj couldn’t manage the angel in is life.